Plants, animals, insects, trees, and flowers die each and every day. There are certain losses that are very traumatic to experience while others go seemingly unnoticed by humans. When an insect dies we most likely do not notice. We may notice if a flower dies in our yard but do we notice if a flower dies in another person’s yard? The honest answer is probably not. When trees die many times people do have an emotional reaction that takes them by surprise. Trees take years to grow so many times we have watched a tree grow for a very long time before it dies. Not seeing that tree anymore can be very sad or alarming. How do you know if your tree is dying? Can you save a tree that is dying? 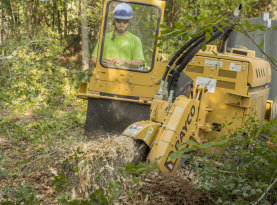 Milam’s Tree Service wants to spend some time on this topic with you today. One of the first signs that a tree is dying is the leaves on the tree will begin to change. The signs will depend on what type of tree it is. Deciduous trees may drop their leaves during the growing season. The leaves may also turn brown and brittle during growing season. Yellow leaves on a tree that is normally green is also an indicator that a deciduous tree is dying. Evergreen trees normally have green needles. If the needles start to become red, brown, or yellow that is a sign that the tree is dying. Most of the times warning signs can be found if you look at the branches of a dying tree. If the branches are bare when they would normally be full of leaves that is a bad sign. Branches can also lose their bark as they die. When the branches have completely died they will break off. 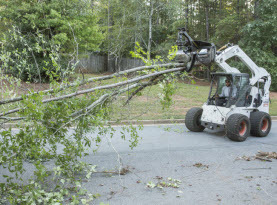 Sometimes branches do come off as a self-pruning system so make sure you know if branches breaking off are considered normal for your tree type before panicking. Fungus may grow on dead branches. Fungus only grows on decaying wood. Holes made by insects can indicate that your tree is dying as well. You can typically see signs that your tree is dying on the trunk of your tree. If the trunk of the tree has places that do not have bark on it that is a sign of a problem. Carpenter ants near your trunk are also a sign that your tree is dying. Carpenter ants love to infest dead wood. Similar to branches, fungus growing or insects boring holes in the trunk can both be indicators as well. There can be signs on the roots of your tree too. Unfortunately since roots are underground we cannot always see the damage that is happening to the roots of our trees. The roots can become slimy. Knots may begin to show in the fibers of the roots as well. If you notice any of the signs above can you save your tree? In order to answer this question you will need to call a professional. 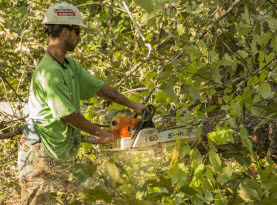 Here at Milam Tree Services we are familiar with many different types of trees. If we can help your tree revitalize we will walk you through any steps that you will want to take. 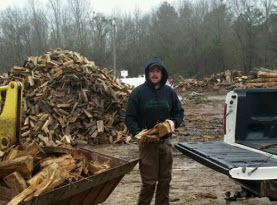 If your tree cannot be saved we offer tree removal services as well. Give us a call today!